Rahm ready to take over Daley&apos;s scam contract minority deals. Someday, Daley will wake up on his deathbed and feel regret for shortchanging the black community out of a fair share of his bogus minority set asides. 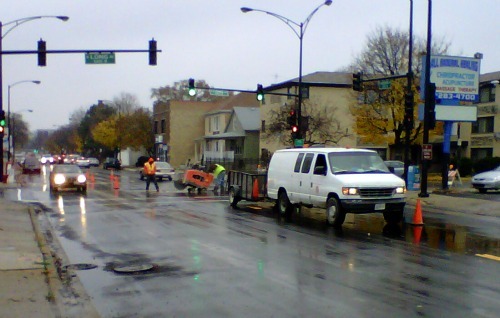 Almost all the construction in the City of Chicago seems to go towards Hispanic Companies. Daley and his personal police, the Office of the Inspector General never check if these workers are paid prevailing wage. Today at Long Street and Addison, this company was saw cutting. This company’s name was not on the permit. Rahm is running for mayor of Chicago because he has Obama to cover the criminal activities in Chicago. If the Office of the Inspector General allows Rahm to run for Office of the Mayor of Chicago and not challenge his residency, than we know this office is a joke. Rahm was not in Chicago for two years, had no residence and the OIG fired many people for less. Let’s see if the legal system in Chicago is just for rich white folks. Photo by Patrick McDonough. Why are these people working on Saturday? Hay pat did you see the Sun-times ,there is Rham and a bunch of people,look who is in the back round, is that a city worker? Buddy, we got to ban together and stop Rahm (#@&*)%) Emmanuel. he is 10 times worse than Daley. And all Daleys men are behind Rahm. We got rid of daley but we cannot party yet. i am a white republican and I am very at ease voting for any black man or woman that is not Rahm Emmanuel. Rahm would be like a gestopo taking over. Not Joking.